May I Introduce You to the Toner of Your Dreams? For decades, I've suffered from a skin condition that causes excessive flakiness and peeling all over my face and scalp. It got so bad at one point that I actually sought the help of a dermatologist to address the issue once and for all. Unfortunately, he wasn't able to provide me any valid strategies to treat the condition. Sometime later, I stumbled on an all natural solution in the form of apple cider vinegar. For years, ACV has been my daily toner. The acidic nature of apple vinegar is exactly what my skin needed. Throughout the years, I've been able to manage my seborrheic dermatitis as long as I relied on the healing properties of ACV. This past weekend, I stumbled on a possible alternative toner that may be even more amazing for my skin. My new and improved toner is a combination of two amazing toning products in one. What's better than apple cider vinegar toner? Apple cider vinegar rosewater toner! To me, rosewater vinegar toner sounds like a dream come true. If any of you use apple cider vinegar directly on the skin, you understand that it has some drawbacks. First, it stinks. Although the scent doesn't last forever, anyone within your vicinity immediately after application will know that your face is smeared with vinegar. Secondly, vinegar tends to leave the skin feeling a bit dry. This typically means that I'll require a liquid hydrating product like facial essence to quickly bring moisture levels up. By adding rosewater to the mix, I can possibly save myself the extra step. As soon as I learned that this product existed, my mind went back to the time when I learned the secret tip of moistening your Beauty Blender with rosewater prior to applying foundation. I finally tried this out and loved the results! By using a toner that already includes rosewater as an ingredient, I can replicate this experience on a daily basis. When I searched for what others had to say about this ACV-Rose hybrid toner, I learned that some people were also using it as a scalp treatment. This makes sense because of the fact that apple cider vinegar is a miracle for dry flaky scalp. Rosewater is said to have anti-inflammatory properties which can help soothe the scalp. Another benefit of rosewater on the hair is that it can help maintain moisture levels. Some websites claim that rosewater helps increase circulation and blood flow to the skin. If this is true, then rosewater toner on the scalp could be beneficial for helping to promote healthy hair growth. I'm sold on this combination. You can make your own DIY version by mixing rosewater with a little apple cider vinegar or you can purchase one of the premade versions on the market. Heck, you can even consider adding a little witch hazel in there if you have acne prone skin. 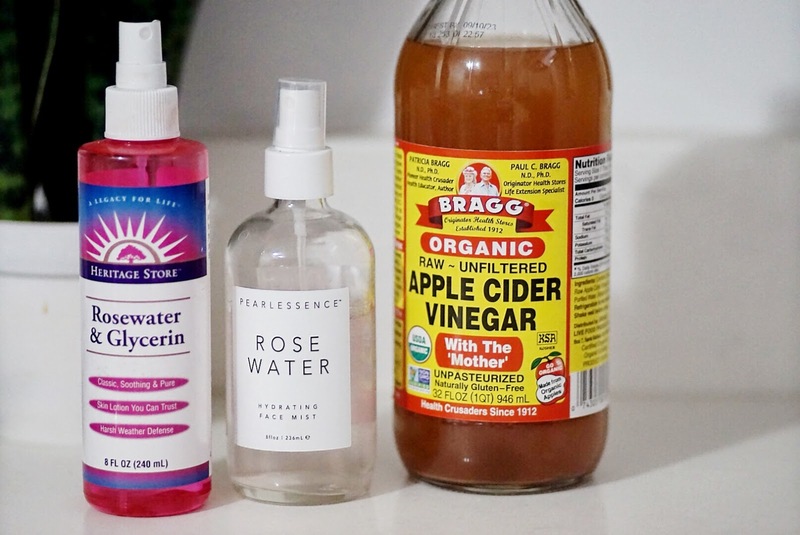 If you've ever thought about trying ACV as a toner but are a bit apprehensive about using straight vinegar on your face, consider vinegar rosewater as an alternative. Thanks so much for this! My dermatitis has been flaring up again lately and I was just about to spend some time today searching for a solution, and here it is! I have ACV and Rosewater at home and will be mixing them up tonight! oh my gosh, i totally forgot that i bought this rosewater vinegar a few months ago as my dry scalp was actin up! thanks for the reminder, must go dig it out! !